A bad picture of my teacher, Stacee and my math book. It is no secret that math is not my strong suit. Look here and here if you are not aware of this fact. People tell me that I have other talents and intelligence in other areas. The most amusing thing about my math challenge is the fact that Mr. Bernie would score in the upper 99th percentile in math. He sometimes talks about things like Hessian Matrices; Kuhn-Tucker Necessary and Sufficient Conditions; and Analysis of Variance – Whatever those are. It does mean that he comes in handy when its time to figure out a tip when we go out to eat or the amount off during a sale. Score!! My friend Stacee is a second grade teacher. One night she called me and asked what my two favorite colors were. I thought it was an odd question but replied, “pink and green.” She thanked me and then hung up. I thought that was a weird and random question but knew that I would figure out the reason for the question some day. That weekend we were at Tractor Supply pimping puppies. Stacee got all excited and went running to her bag to get something. 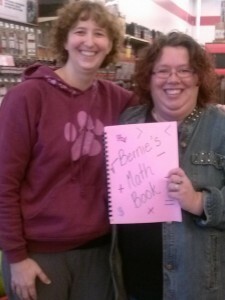 She said, “Look Bernie, I made you a second grade math book! It’s all for you and I’m used your favorite colors for the cover!” I laughed so hard that I almost peed. What a clever idea and how thoughtful. She used a spiral binder thing to hold it together and everything. Very high-tech, I thought. I quickly sat down to do my first page. I had to color some things to make a picture. My friend Sheri peeked over my shoulder and ran to tattle to Stacee. “Tell her to stay in the lines. She is doing it wrong!”, she exclaimed. Then she hissed at me, “If you don’t stay in the line you won’t get a star on that page!” Man, talk about the pressure!! Stacee came over to check my work and in a sweet teachery type voice said, “Bernie, you have to try to be a little neater.” Really? Heck, I have to do math and be neat about it? The pressure!!! Stacee promised that I could pick a toy from her drawer if I turned my book in. I would rather have a beer but if she has a cool toy then that would work as well. We all had a good chuckle about the book and it made the day go faster. When I got home I flew in the door waving my math book. “Mr. Bernie, look!! Stacee made me a 2nd. grade math book. I have to be neat in order to get a toy out of her drawer!! How cool is this? ?” Keep in mind the man is brilliant at math and his wife came running in the door bragging about a SECOND grade math book. He just stared at me for a minute and asked me to repeat what I just said to him. Which I did. Then I handed him the book and he held it like a snake and looked at it like he didn’t understand what was going on and why his wife was bragging about a second grade math book. He took it from me and looked at the first page and said, “That is not very neat work, Bernadette. Do you think that your teacher will give you a star for that page?” Are you friggin kidding me?? He thumbed through the book and chuckled as he looked at the math problems. I kept badgering him, “Don’t you think that is cool??!! !” He looked at me over his glasses and replied, “Do I think it’s cool that my wife is giddy about a second grade math book? Oh, ya sure!” I think he had a snarky tone in is voice, but I ignored it. One night I was doing my workbook and had to ask Mr. Bernie a question. “Mr. Bernie, I need help!” The page had lines to fill stuff in but I didn’t know where I was supposed to get the numbers from. Mr. Bernie looked at the page and said, “Bernadette, what do you think that those pumpkins are doing at the top of the page?” Oh! I quickly counted my pumpkins and those fit in the spots just perfect!! I had another coloring page and it was giving me trouble and I to have Mr. Bernie help again. Well, it turns out that there were two number 58′s and I didn’t see that and that is why my picture didn’t look right. I called up Stacee and started to whine that my picture is not working. She put on her best teacher voice and said, “Bernie, did you pay attention to your work? There are two number 58′s.” I told her that was unfair and I lost my confidence and had to put my math book away for a while. I told her that Mr. Bernie was helping me with my math book. The teacher voice again, “Well if you have problems with your homework, you can show it to me on the weekend and we can work on it. Sometimes the adults in the house don’t do it the same way as we are learning it.” I told Mr. Bernie that and he just snorted. The math terms in the first paragraph are via Mr. Bernie. I asked him to do a quick edit on this and he giggled like a school girl when he put those terms in. I started giggling until he decided he wanted to share what they mean. There is an hour of my life I can’t get back. Oh Bernie! I am awful at maths too! I can do simple maths like adding, subtracting, multiplying & dividing, but give me one of the a = questions & I’m lost before I even finish reading the question! Here is the really weird part – for someone who was so bad at maths, I was an accounting clerk for over 15 years! Luckily for me accounting is basic maths! My hubby is much better at maths than me but not so much I feel like a dumkopf (he’s German) so when I get stuck he can usually help me – but you’re right the explanation is not worth the loss of time. I love that, “awful at maths” there are several types. I guess I never thought about it. Hilarious. I need a second grade math book, too. I’m totally on your page when it comes to math. Thank you. Its good not to be alone in this. Oh, you’re not alone. My eldest joins us in the math deficit. Fortunately she married a math major. Good job. Third grade could be a challenge. Now you need to find a 3rd grade teacher for your next math book. Nooooo, I like Miss Barker. I don’t want to have another teacher. If it’s Bernie’s birthday and she adds how old she is to the year she was born what number will she get? Glad to see you are almost done!! Huzzah!! Thank you. Its just that cutting and coloring to get through. Wait until you get to Roman numerals!!!! Mr. Bernie had a little lesson on those a few weeks ago.